- At the party, Squirrel snapping at Sam that he's a two- timer for going out with Ren, then storming off. Sam thanking Ren for helping him out. - Cody telling Stonie that she likes the idea of sailing down the river. The two of them kissing and a photo being taken of it by Rupert Sprod, to Cody's horror. The next morning, Sam rides up the street on his bike. Cody emerges from No. 24 and groans at him about the noise. She asks him where he was and Sam explains that he stuck around to tidy up after last night. Cody invites him in for a coffee. Inside, Cody pours coffee and Sam groans that you should never have punch at a party. Cody asks if it was spiked and Sam nods that it was. Cody then tells him that Stonefish kissed her – but she insists it's definitely not happening again, and he'll have forgotten about it by now. At that moment, there's a knock on the front door and Cody goes and answers it. She finds Stonefish standing there with a bunch of flowers for her! Philip and Hannah are going through sheet music to increase the barbershop quartet's repertoire when the front door opens and Helen comes in. Philip and Hannah jump up and greet her, welcoming her home. Helen smiles that it's nice to be back and she asks what's been happening. She then asks Philip where the roses are, as the ones in the garden have been cut…! Karl and Susan are unpacking some boxes and Susan digs out Karl's appointment book and a family photo amongst other things. She suggests that they should probably get a start on Tamsin's room. Karl says he's glad she's coming on- board the partnership: she's got experience and integrity. Susan grins and asks what sort of partnership they're talking about here! CHIP: I really care about you, Ren. REN (coolly): Well, you've got a weird way of showing it. Chip presses her to come. Ren gives in, smiles and muses that she must be a masochist! Stonie is looking for scissors in the kitchen. Cody tells him that he shouldn't have brought the roses: he has to accept that she can't be his girlfriend; she's with Rick and that is not going to change – at least, not in the foreseeable future. Stonie suddenly cuts his finger on a thorn and Sam goes to get a band aid. Cody tells Stonie that it was just a kiss and didn't mean anything. There's suddenly a knock on the front door and Sam goes and opens it to Squirrel. Cody asks what brings her there. Squirrel grins at Sam and smiles that he was great; he's gorgeous! PHILIP: It was touch and go there, for a while. HELEN (sympathetically): Isn't easy, is it? HELEN: She's loving it! She and Tracey are inseparable. In fact, she's going to enrol in Tracey's school for the next semester. And guess what: she is even putting on weight. PHILIP (relieved): Now that *is* good news. Philip suddenly looks at his watch and realises that he should have left ten minutes ago. Helen asks for a lift, adding that Rosemary told her about the new doctor's surgery and wants her to pass on her best wishes to the new tenant. Ren emerges from No. 30 as Sam goes to climb on his bike. He walks over to her and tells her that he wanted to apologise for last night. Ren, however, tells him apologetically that she shouldn't have come running to him just because Chip stood her up. Sam says in return that he shouldn't have bitten her head off like that, but Squirrel was being a pain in the neck and the party was out of control… he must just have been in a bad mood. Ren tells him that *Chip* was in a bad mood, which is why he didn't turn up. Sam asks her if she's going to give him the flick, but Ren explains that she's having dinner with him tonight: everybody's entitled to a second chance. Helen walks in from outside and apologises for barging in. 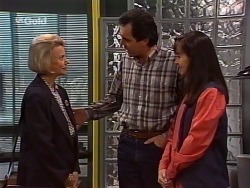 Karl introduces her to Susan and Helen tells them both that she just wanted to say hello and welcome them to Lassiter's. Karl invites her to take a look around. Helen explains that Rosemary – her daughter – is delighted that they're moving in there: it'll be very good for the complex. Chip has turned up and he sighs at Sam that he really stuffed- up last night and he wants advice on how to avoid doing it again. Sam mutters at him to try showing Ren a bit of respect for a change. Looking suddenly annoyed, Chip exclaims that he's had just about enough of Sam; what's his problem? Sam snaps at him to take a look in the mirror. Chip glares at him and then marches out. Philip is dressed up in his barbershop quartet outfit and is practising his a capella singing! Susan comes in and grins that that's lovely! Philip stops singing, looking embarrassed. He then offers her Susan draw in the Melbourne Cup for tomorrow and she asks for five, one for each of her family. She then asks for recommendations for magazines for Karl's waiting room. Cody comes in and asks Philip for foolscap binders. Philip points them out. As Cody goes to get them, Susan tells Philip that Helen's going to lend them some paintings for the waiting room. Cody, overhearing, asks if Helen's *back*. Philip explains that she got back this morning. Cody asks where she is now and Susan replies that she's at the coffee shop: she left her with Hannah. Cody dashes off! A short time later, Cody is sitting with Helen and Hannah, asking Helen if she saw Rick! Helen replies that she didn't see him in person, but she believes he's still at the Montana complex and she knows Rosemary is very happy with the work he's doing and she feels he's ready for more responsibility at the Lassiter's complex. Cody beams that she can't wait to see him. Helen then asks Cody how *she* is. Cody explains that Marlene and Sam are setting up their own shop and Annalise is busy with her wedding preparations. Helen asks in surprise whose wedding she means, and Cody explains that she and Mark are finally going to do it! Helen invites her over for dinner tonight. Chip walks in and tells Susan – who's in the waiting area – that he'd like to see a doctor. Susan says they're not open yet, but Karl emerges from the consulting room and tells Chip that if he doesn't mind a bit of fresh paint and some rough edges, he's more than welcome. They head into the room and Karl asks Chip what the problem seems to be. Chip replies that he's been having trouble sleeping lately – it's nothing serious and he just wondered if Karl could give him something for it. Karl, however, says he'd prefer to do a thorough medical examination first. Chip asks angrily if he needs a full examination just for a few pills, and he accuses Karl of thinking he's a drug addict. He gets up and storms out. Sometime later, Susan is sitting behind the reception desk, yawning. Karl tells her that he prescribes rest: she looks exhausted. 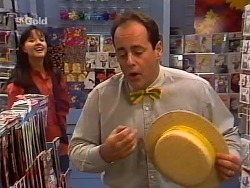 Susan comments that she thinks she saw that boy from earlier in Ramsay Street – she thinks he's a friend of Ren Gottlieb's. She asks what's wrong with him and Karl says he thinks it might be drugs. Susan comments that he looked kind of dangerous. Chip has turned up and Ren smiles that she thought he'd forgotten her again. Chip tells her that he promises that in the state he was in, she was better off out of it last night – but he'll make it up tonight. They head out. Philip, Hannah and Cody are looking at various paintings of Helen's, trying to help her decide what to offer Karl and Susan for the surgery. Helen shows off a modern- looking painting, but Philip says he doesn't think it'll be suitable for a doctor's surgery; maybe if Karl was a psychiatrist…! SAM: Look, I'm not interested, OK? I never have been and I never will be. The sooner you get used to that, the better. SQUIRREL (pouts): But what about last night? He asks Squirrel to please stop bugging him. Squirrel stares at him and then shrugs that if that's the way he feels about it… She walks off. CHIP: You're all the same, aren't you – always trying to put me down. REN: I wasn't trying to put you down. CHIP: You must think I'm some kind of an idiot. REN (annoyed): Look, I don't have to hang around for this. CHIP: It's time people like you realised you can't treat me like dirt and get away with it. He then turns and starts swiping things off the coffee table and onto the floor in anger, before collapsing in a chair, looking furious.